Carlquist, S. 2000. Wood and bark anatomy of Takhtajania (Winteraceae); Phylogenetic and ecological implications. Annals of the Missouri Botanical Garden 87:317-322. Doust, A. N. 2000. Comparative floral ontogeny in Winteraceae. Annals of the Missouri Botanical Garden 87:366-379. Doyle, J. A. 2000. Paleobotany, relationships, and geographic history of Winteraceae. Annals of the Missouri Botanical Garden 87: 303-316. Doyle, J. A., C. L. Hotton and J. V. Ward. 1990. Early Cretaceous tetrads, zonasuculate pollen and Winteraeae. I. Taxonomy, morphology, and ultrastructure. American Journal of Botany 77:1544-1557. Doyle, J. A., C. L. Hotton and J. V. Ward. 1990. Early Cretaceous tetrads, zonasuculate pollen, and Winteraceae. II. Cladistic analysis and implications. American Journal of Botany 77:1558-1568. Ehrendorfer, F. and M. Lambrou. 2000. Chromosomes of Takhtajania, other Winteraceae, and Canellaceae: Phylogenetic implications. Annals of the Missouri Botanical Garden 87:407-413. Endress, P. K., A. Igersheim, F. B. Sampson, and G. E. Schatz. 2000. 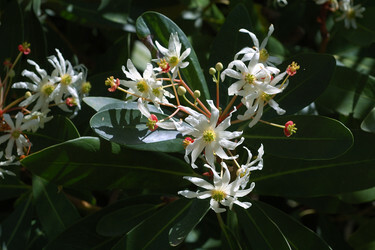 Floral structure of Takhtajania and its systematic position in Winteraceae. Annals of the Missouri Botanical Garden 87:347-365. Feild, T. S., T. Brodribb, and M. Holbrook. 2002. Hardly a relict: Freezing and the evolution of vesselless wood in winteraceae. Evolution 56:464-478. Feild, T. S., M. A. Zwieniecki, and M. Holbrook. 2000. Winteraceae evolution: An ecophysiological perspective. Annals of the Missouri Botanical Garden 87:323-334. Karol, K. G., Y. B. Suh, G. E. Schatz, and E. A. Zimmer. 2000. Molecular evidence for the phylogenetic position of Takhtajania in the Winteraceae: Inference from nuclear ribosomal and chloroplast gene spacer sequences. Annals of the Missouri Botanical Garden 87:414-432. Sampson, F. B. 2000. The pollen of Takhtajania perrieri (Winteraceae). Annals of the Missouri Botanical Garden 87:380-388. Schatz, G. E., P. P. Lowry, and A. Ramisamihantanirina. 1998. Takhtajania perrieri rediscovered. Nature 391:133-134. Suh, Y., L. B. Thien, H. E. Reeve and E. A. Zimmer. 1993. Molecular evolution and phylogenetic implications of internal transcribed spacer sequences of ribosomal DNA Winteraceae. American Journal of Botany 80:1042-1055. Tobe, H. and B. Sampson. 2000. Embryology of Takhtajania (Winteraceae) and a summary statement of embryological features for the family. Annals of the Missouri Botanical Garden 87:389-397. Van der Ham, R., and B. J. Van Heuven. 2002. Evolutionary trends in Winteraceae pollen. Grana 41:4-9. Vink, W. 1988. Taxonomy in Winteraceae. Taxon 37:691-698. Vink, W. 1993. 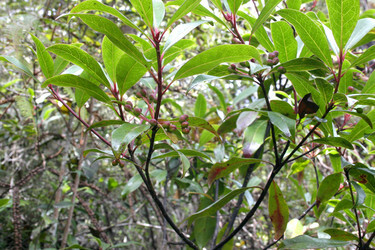 Winteraceae. Pages 630-638 in: The Families and Genera of Vascular Plants. II. Flowering Plants: Dicotyledons, Magnoliid, Hamamelid and Caryophyllid Families. K. Kubitzki, J. G. Rohwer, and V. Bittrich, eds. Springer, Berlin. Walker, J. W., G. J. Breener, and A. G. Walker. 1983. Winteraceaeous pollen in the Lower Cretaceous of Israel: early evidence of a magnolialean angiosperm family. Science 220:1273-1275. Page: Tree of Life Canellales. The TEXT of this page is licensed under the Creative Commons Attribution-NonCommercial License - Version 3.0. Note that images and other media featured on this page are each governed by their own license, and they may or may not be available for reuse. Click on an image or a media link to access the media data window, which provides the relevant licensing information. For the general terms and conditions of ToL material reuse and redistribution, please see the Tree of Life Copyright Policies.